Whether you just bought a new home and are faced with toilet bowl stains from previous owners or have neglected your cleaning duties for a little too long, stubborn toilet bowl rings can be one of the most difficult things to clean. In some cases, porcelain toilets are prone to picking up these stains and holding onto them even with regular cleaning. These stains can be dark, slimy, and make the toilet look like it hasn’t been cleaned in ages. Caused by a buildup of minerals found in hard water, stubborn toilet bowl rings are a common problem. Here are some ways you can eliminate toilet bowl rings for good. Ideal for less problematic stains or for those who are tired of using harsh abrasives and toxic chemical cleansers, vinegar is a natural way to clean your toilet. One method is to place three cups of vinegar into the toilet bowl and scrub the stains away with a brush. The other method is to put the vinegar into a spray bottle, drain the toilet bowl, and spray the solution directly onto the stains. Unfortunately, vinegar might not be strong enough to remove extra tough stains. If this tip doesn’t work out for you be sure to try one of the other solutions found below. Although borax paste is sold in hardware stores it’s a powerful cleaning agent that can be used to clean a variety of tough household stains – toilet bowl stains included. Start by shutting off the water supply to the toilet and draining the toilet do the hard water stains aren’t covered by water. Make the paste by mixing ½ cup borax powder with enough vinegar to form a paste. From there, liberally spread the paste over the stains until they’re completely covered. Allow the paste to sit for about twenty minutes before scrubbing it off with a toilet brush. If successful, the stubborn stains should come off with the paste. Sometimes what’s hidden away in your kitchen can work wonders for hard water stains, and Lemon Kool-Aid is one of those hidden wonders. Simply empty a packet into the toilet, let it sit for a bit, and scrub away the stains with a brush. Lemon Kool-Aid works in the dishwasher too! If you notice a build-up of soap scum in your dishwasher, just replace the soap or detergent with a packet of Lemon Kool-Aid, run an empty load through a regular cycle, and your glasses and plates should come out crystal clear. Believe it or not, you can use a can of Coke as a cleaning agent in the bathroom. Although pouring a two liter bottle of Coke into the toilet may sound a bit odd, it’s an effective way to clean stubborn toilet bowl rings. Usually all you’ll need to do is let the Coke sit in the toilet bowl for about thirty minutes before wiping away with a soft rag. For extra cleaning power, let the Coke sit in the toilet overnight before scrubbing. Note: since it’s the phosphoric acid that does a lot of the cleaning work (and not the actual Coke), it’s just as effective to use soda water in lieu of Coke. Since this method is a rather dramatic way of cleaning stubborn toilet bowl rings, it should only be used if the above methods didn’t work. Make sure to use the weakest form of the acid possible and wear protective gear while working with muriatic acid. Before starting, ensure the toilet bowl is empty and the water supply has been turned off. 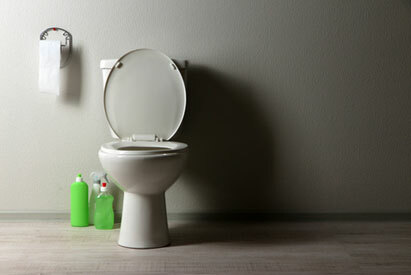 Muriatic acid works by eating away the first layer or two of your toilet bowl, thus getting rid of the stain. Just be sure to follow the directions on the back of the package closely, as using too much muriatic acid can be harmful. In 2014, color and design trends were all about the kitchen – shelving was more open, cabinets went darker, and metallic accents could be found throughout the space. In 2015, we can expect to see major changes in the design and aesthetics of a different room in the house – the bathroom. From color schemes and tile patterns to bathtub design and plant life, there’s plenty of design trends and bathroom features to look forward to in 2015. For bathrooms, the trend in color is more, and has been for the past few years. While you’ll still see plenty of white and neutral shades in bathrooms, there’s no time like 2015 to experiment with the color wheel. If you’re too apprehensive to paint your entire bathroom in a bold, beautiful color, try adding small doses of cheerful colors, like sunny yellow or ocean blue. Pantone’s Color of the Year, Marsala, would look great in virtually any bathroom – the earthy tone embodies confidence and stability, is universally appealing, and works well on its own or as a strong accent to many other colors. If you’re eager to incorporate plants in your bathroom but aren’t sure where to start, vertical gardens are the hot trend in 2015. They’re a great alternative to potted plants, and are an easy way to dress up the walls of your bathroom. An added benefit of green or living walls is the health benefit: they’ll help purify the air of toxins and are beneficial for the environment. Some potted plants need particular conditions in order to thrive, so check with your local nursery about which types of plants prefer to live in the moist, humid conditions of a bathroom before investing in a vertical garden. According to industry experts, America’s love affair with freestanding bathtubs is here to stay. They’re a popular choice for a variety of reasons: they’re aesthetically pleasing and help set the mood for rest and relaxation. When choosing a freestanding bathtub for your space, pay attention to the design of the tub. If you want the look of a freestanding bath with the added convenience of a built-in tub (such as ledges for storing soap and shampoo), consider installing a semi-inset stand-alone bath. Experts predict this design trend will prove to be popular among homeowners in the years to come. These days, people are looking to achieve an “open” feeling in the bathroom, especially when it comes to shower space. Walk-in showers, also known as doorless showers or no-threshold showers, have been popular in five-star hotels for decades but, in 2015, expect to see them installed more often in modern homes. Not only are these types of showers pleasing to the eye, but they add accessibility for anyone, particularly seniors, who may have a hard time stepping up and over to access their showers. In the past, grout was a mundane and essential element that pulled a bathroom together. Gradually, people are warming up to the idea of using grout as a creative feature in their bathroom. Grout can be used to show off the pattern of a how a tile is laid, and can highlight specific tile types or designs. Think of it as an update to subway tiles: a trend that took the design world by storm a few years ago. For a striking and dramatic effect, consider pairing black grout with white tiles (or vice versa), or using colored grout alongside bold geometrically shaped tiles. When you hear the words “backsplash”, the first thing that probably comes to mind is traditional tile in neutral colors. Although tile is the most popular backsplash design in America, it isn’t the end-all-be-all of backsplashes. While tile is a fine choice, why not express your individuality with a creative backsplash that’s guaranteed to be a conversation-starter among family and friends? If you’re interested in bringing some style to your bathroom, try one of these creative backsplash ideas that won’t break your budget. While pegboard is definitely an out-of-the-box backsplash choice, it’s as stylish as it is functional. The pegboard can easily be painted to match the color scheme of the rest of your bathroom and provides extra storage and display space. The inexpensive pegboard panels can be purchased from any home improvement store and are easy to fasten to the walls – even a novice DIYer won’t have a problem with the task. Purchase some hooks, and you can free up valuable storage space by hanging hair dryers, curling irons, toothbrushes, or other bathroom accessories from the pegboard. We’ve all seen penny floors and kitchen countertops, so it was only a matter of time until they invaded bathroom backsplashes. Perfect for bathrooms with a rustic or traditional ambiance, penny backsplashes can be purchased from manufacturers and installed by professionals or can be built from the ground-up with a bit of grout, a massive penny collection, and some TLC. Although some question the legality of using federal currency for decoration, we highly doubt the U.S Department of Treasury will show up at your door over a chic and stylish penny backsplash. Whether you’re a world-traveler or just a dreamer, express your personality by using a world map as your bathroom backsplash – I bet you can already imagine yourself daydreaming of your next vacation while you brush your teeth. The best thing about this idea is that it isn’t limited to maps: you could use wrapping paper, your favorite comic strip, magazine covers, newsprint, or whatever you prefer! For the DIYers at heart, simply cut a thin piece of plywood to the exact size of the wall, glue the paper on top, apply shellac and, when dry, attach the plywood directly to the wall. Vintage, reclaimed, salvaged, antique, rustic – they all mean relatively the same thing, and they’re all trending in home decor right now. Although you can easily ‘fake’ the worn wood look by purchasing distressed wood or weathering it yourself, there’s nothing quite like the real thing. To make this backsplash on your own, cut a thin piece of plywood to the exact wall size, attach the strips or pieces of salvaged wood, and screw the whole thing directly onto the wall. Using salvaged wood for your backsplash is great for cottage-style homes or a bathroom in need of a bit of texture. Whether you use a genuine chalkboard or a coat of chalkboard paint, a chalkboard backsplash is great for the walls near a vanity – write yourself notes, leave a reminder for your husband, or invite friends and family to draw a picture that’s representative of themselves. If you intend to use this idea in a child’s bathroom, why not extend the idea to the walls surround the bathtub? Your child can express their creativity (and stay occupied) during their evening baths, and you won’t have to worry about having to scrub crayon residue or permanent marker from the walls! If you have a baby on the way, here’s an important statistic: drowning is the leading cause of unintentional death among children between the ages of 1 and 4, and it only takes a few inches of water to kill a child. Although outdoor pools are the leading threat, bathtubs are the second most common place a child can drown. Although the bathtub is a major danger zone for a child, the potential risks found in a bathroom range from accidental poisoning to electrocution. Below are the primary danger zones, along with childproofing tips for each. Once your baby outgrows their baby bathtub, they’ll be ready to take baths in a regular tub – but not before you spend some time childproofing. To prevent scalds, adjust the thermostat so your tap water is no warmer than 120°F, and test the bathwater on your wrist before putting your child into the bath. If you live in an apartment and can’t control the water temperature, you can purchase showerheads and faucets with anti-scald technologies. Never leave your child unattended during a bath, for any amount of time. If you need to answer the phone or door, take your baby with you – a drowning can occur in just one or two inches of water, and in a matter of seconds. While curling irons and flat irons should be kept away from children for obvious reasons, common bathroom appliances pose more than a burn risk: they can cause fatal electrocutions. In order to avoid electrocutions, keep all appliances locked away and out of reach when not in use. As with other rooms, all exposed outlets should be covered – especially those located near the bathroom sink or tub. In order to get used to the idea of putting appliances away after use, start doing this as soon as you find out you’re pregnant – that way, putting them away will be second nature by the time your baby is born. Did you know a child goes to the emergency room every eight minutes for medicine poisoning? If possible, you should store medications, cleaning products, and sharp bathroom-related items on a high shelf in a linen cabinet, or locked away in a cabinet with a latch. You might think keeping these items in a medicine cabinet or under the sink might do the trick, but young children are naturally curious and will find their way into these areas if there isn’t a lock. Latches designed to keep kids from accessing the contents of a cabinet are a highly effective and affordable way to provide parents with peace of mind. As previously mentioned, babies and young children are curious by nature, and can easily fall into a toilet headfirst. In order to avoid accidental drownings, always keep the toilet lid down and install a toilet lock. Parents should educate all family members who use the bathroom to close the door when not in use, and to re-engage the toilet lock after each use. Additionally, you don’t want your child to use the toilet as a stepping stool to reach the sink, so keep a stool in the bathroom which your child can use to reach the sink when they wash their hands or brush their teeth. When childproofing a bathroom, get on your hands and knees so you can view the bathroom from your child’s point of view. If towel bars can be used as handrails by a climbing child, move them to a different area. Check the laundry chute or hamper to make sure your baby can’t get trapped in it, and hide the trashcan behind a locked door. If your bathroom floor gets slippery when wet, purchase a bath mat for inside and outside the tub – just be sure to find ones that dry quickly, as mold and mildew can quickly become an issue.